We are pleased to announce that Opto Engineering, the telecentric company, will be exhibiting at the AUTOMATION 2012 tradeshow, which will be held in September 7-10 in Mumbai. 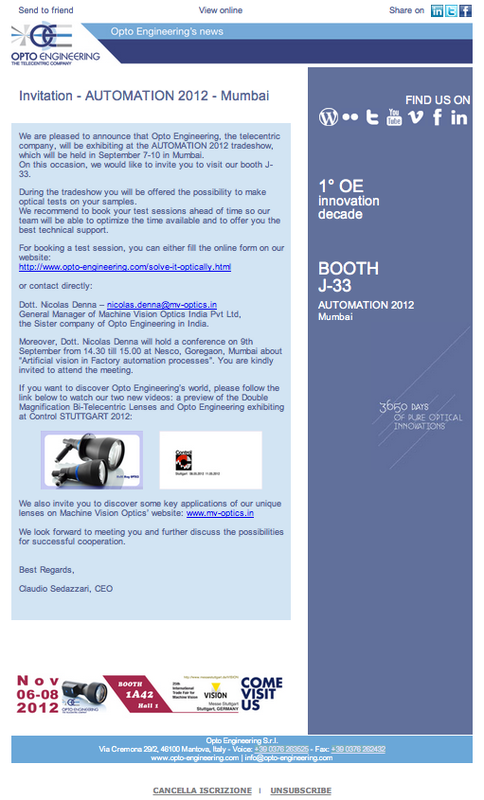 On this occasion, we would like to invite you to visit our booth J-33. During the tradeshow you will be offered the possibility to make optical tests on your samples. We recommend to book your test sessions ahead of time so our team will be able to optimize the time available and to offer you the best technical support. the Sister company of Opto Engineering in India. Moreover, Dott. Nicolas Denna will hold a conference on 9th September from 14.30 till 15.00 at Nesco, Goregaon, Mumbai about “Artificial vision in Factory automation processes”. You are kindly invited to attend the meeting. We look forward to meeting You and further discuss the possibilities for successful cooperation.